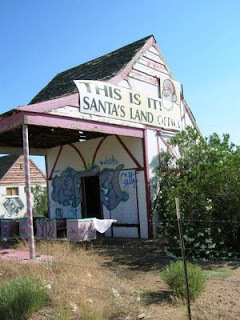 Was thinking about Santa Land today. Beautiful Arizona...thinking about another trip yonder. Merry Xmas. Badger wishes all a Happy Hanukka! I missed out on tickets to see Yo La Tengo's residency at Maxwell's this week in honor of the holiday so Badger and I have been spinning that Cider EP and catching up on some reading/viewing instead. A shame since last night's show looked especially great. Here are a couple of examples of SST tuners, Ginn's pre-Flag (coexisting at the beginning) hobby. Jack White's New York Times profile was a fascinating read. I'm a fan of both Jack's music and philosophy about music, so this long-form profile was a great peer into his aesthetics. Mariano Rivera is set to return next year, thankfully. I don't know what life will be like without him. This old article breaks down a decade of pundits declaring him too old. I'm certain more will pour out in April and beyond, and just as certain the authors will eat their words. A tale about high school, OZZY, and discovery. A fun little tale that brought back a lot of memories, or at least hazy recollections, about my high school experience. No Ozzy for me (Sabbath came later, still not on the Crazy Train) but a lot of this hit home. Nirvana on Top of the Pops. I'm not sure why, but I've spent a lot of time listening to Nirvana and thinking about their arc. Could they have imagined they'd hit they way they did? I doubt it, and it's understandable how they'd end up so uncomfortable with the world they ended up in. So it's cool to see them take little jabs at their situation as with this video. As WFMU explains, BBC asked the band to mimic their instruments and play the instrumental track from the album while Kurt performed a live vocal track. This awesomeness was the result. And now a couple of photos from Friday's Occupy Sandy/Stiller Foundation benefit that Tom Scharpling & Ted Leo put together. Auctioneer John Hodgman inspired the crowd to bid about $7-8K on the packages offered. Kristen Schaal & Brooke Shields showing off their "Brooke Shields eyes".